Been using nimbuzz since my n97 days cause its easier to use than any other messaging app, plus it consolidates most of the messaging communities I used (yahoo messenger and facebook chat). Today, nimbuzz release the latest iteration of their chat program for symbian which is heavily optimized for S^3 (and still works on S60 devices as well). Customizable tabs: select which tabs you want to see and in what order. NimbuzzOut call rates are displayed in real time below the number before placing the call. 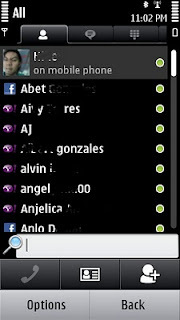 Recent calls tab: see all your received, missed and outgoing calls. 2 new chat styles: with avatars and without. 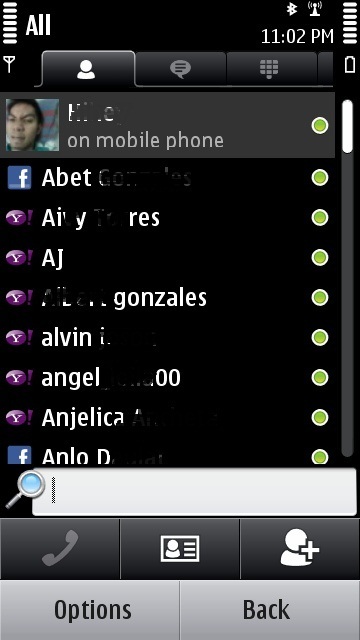 3 options to view the Contact List. My info tab: gives you quick access to your profile, NimbuzzOut credits, accounts, suggested friends and friend invites. Facebook Connect: removes the 400 contacts limit and connectivity issues. Most changes are on customization, where in you can dictate which tabs to be displayed or how your contacts and chat windows will be displayed. Nimbuzz also now uses facebook connect as a way to authorized facebook accounts unlike before where in they explicitly ask for the account details themselves (i feel more secure now) - dont forget to re-authorize your facebook account on nimbuzz. I'll update this post as I continue playing with the new version. To learn more about the updates, read the nimbuzz blog. One problem thought is that, I haven't had a successfully experience on voice call using the yahoo messenger on nimbuzz where in the other line here's my voice. Problem started since I bought my n8 and nimbuzz 2.4.